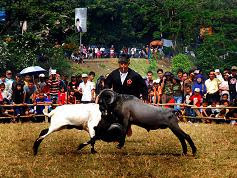 Inspired by animals sheep, which is characteristic of Garut, was born Dodombaan art attractions. 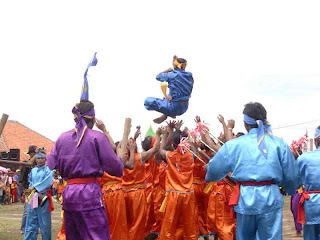 Dodombaan dance is an art game that uses a set of drums sheep Pencak silat is sounded with a certain rhythm. Art comes from the village Dodomboan Panembong, Bayongbong District, Garut regency. Attractions in the form of one or two people doing martial arts, with about eight people who carry two sheep sculptures made of wood. This wood sculpture of sheep can be climbed the children and adults. This traditional art is also known by the name Boboyongan Eson. Surak Ibra created by Raden Djadjadiwangsa, son of Raden Wangsa Muhammad (Prince flat) in 1910 in Kampung Sindangsari, Cinunuk Village, District Wanaradja, Garut regency. Actually, this art implies sarcasm or statements of disapproval to the Dutch government at the time. In Surak Ibra also contained an intention Garut community to have its own government and leaders with the spirit of unity between the government and society. Manned by 40-100 players, Surak Ibra featuring performances by a drum Penca art equipment, Angklung, dog-dog, clappers, and others. Perhaps, as this attraction comes from a good figure to climb trees, which used to be called Mr. Lais. Lais itself an acrobatic performance art with a 6-meter rope which stretched and linked in between two bamboo with a height of about 12-13 meters. 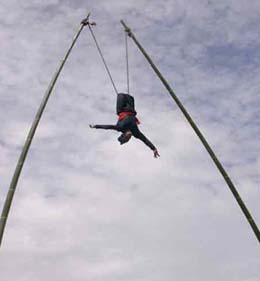 Initially, players Lais climbing bamboo, and then move on to a rope while dancing and spinning in the air without the use of safety belts. 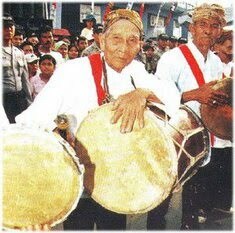 As penyemarak, this attraction is accompanied with the sounds of traditional musical instruments. This art grew and flourished in the village of Bojong, Bungbulang District, Garut regency. The art is filled with nuances syiar Islam. Hadro itself is a blend of Islamic songs (blessings), followed by martial arts movements. Perhaps, this art is a form of Islamic syiar well as one form of self defense against invaders.